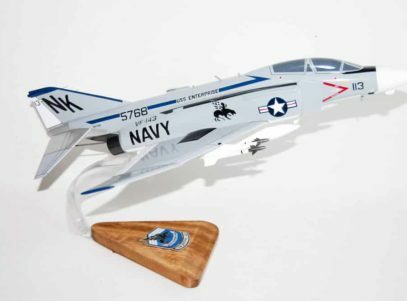 Launch off the USS Enterprise with VF-143 Pukin Dogs in this wooden F-4J model! This 18 inch model is carved from wood and hand painted to provide a unique piece you’ll love. Collect all your squadrons with truly artistic craftsmanship of the Navy’s finest symbols. FIGHTER SQUADRON ONE FOUR THREE The World Famous Pukin’ Dogs were originally commissioned in 1949 as VF-871, a reserve squadron known as the “Griffins.” Based out of NAS Alameda, Calif., the Griffins were first called to active duty on July 20, 1950. 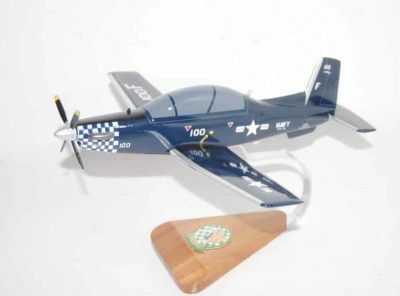 Once on active duty, the squadron took the F4U-4 Corsair to war in Korea from the decks of the USS Princeton (CV 37) in early 1951 followed by the USS Essex (CVA 9) in 1952. 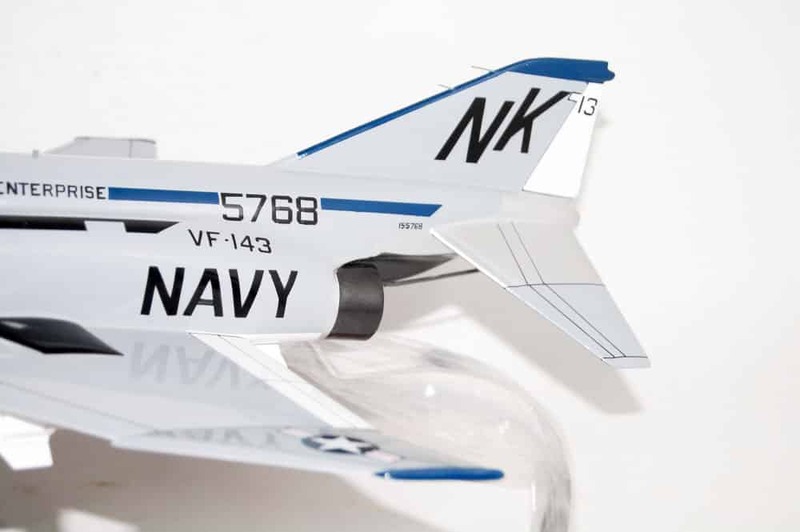 Over the next eleven years the squadron changed aircraft and designations twice: as VF-123 flying the F9F-2 Panther and F9F-8 Cougar, and then as VF-53, flying the F3H-2 Demon. 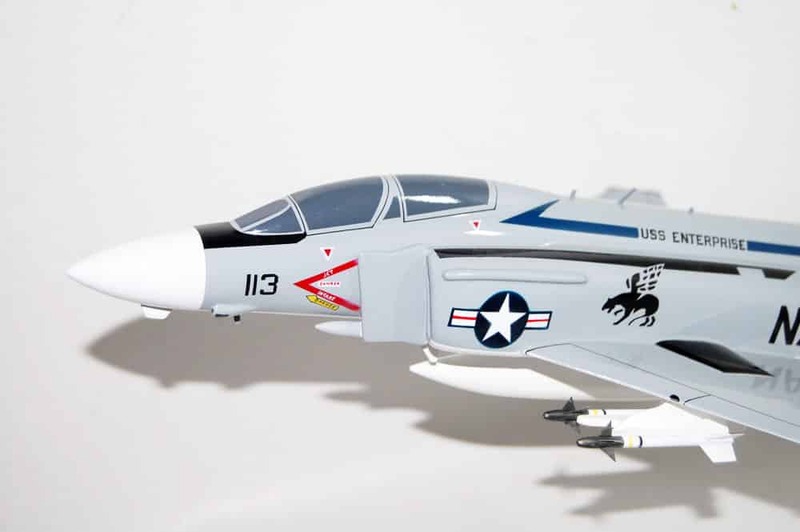 Finally, on June 20, 1962, the squadron was redesignated VF-143 as they transitioned to the F4H-1 Phantom II (later redesignated the F-4B). The Pukin’ Dogs first cruise as VF-143 was a WESTPAC aboard the USS Constellation (CV 64) in February 1963 . 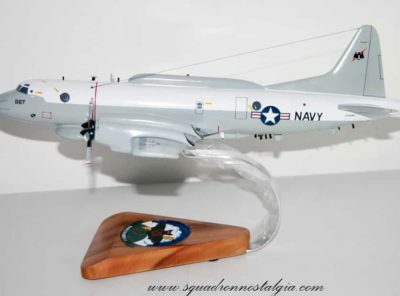 Operating as part of Carrier Air Wing 14 the squadron responded to the Gulf of Tonkin incident by flying in the Pierce Arrow attacks on North Vietnamese naval facilities on August 5, 1964. In the succeeding years, the Pukin’ Dogs transitioned to the F-4J and recorded seven combat deployments to Vietnam. It was during one of those deployments in 1967 that two Dogs, LTJG Robert P. Hickey JR, USN and his RIO LTJG Jeremy G. Morris, USNR engaged and successfully destroyed a Vietnamese MIG 21 with an AIM 7 Sparrow air to air missile; making them the Pukin’ Dogs first official MIG killers. On April 1, 1975, after completion of F-14A Tomcat transition training, the Pukin’ Dogs permanently moved to their present home at NAS Oceana, VA As part of CVW-6, VF-143 made its first F-14 carrier deployment aboard USS America (CV 66) from April 15 to October 25, 1976. During this Mediterranean deployment, the squadron participated in “Operation Fluid Drive,” providing CAP for the evacuation of American citizens from Beirut in 1976. In the following years the Pukin’ Dogs participated in a South Atlantic cruise (June 10 to July 19, 1977) followed shortly thereafter by a Mediterranean cruise (Sept. 29, 1977 to April 25, 1978). In the fall of 1978, VF-143 joined USS Dwight D. Eisenhower (CVN 69) and Carrier Air Wing Seven (CVW-7). In 1979 they made IKE’s first major deployment to the Mediterranean Sea from January 16 to July 13. VF-143 and the IKE next spent 152 days continuously at sea during their 1980 cruise. The squadron then made a brief NORLANT cruise, between Aug. 17 and Oct. 7, 1980, and participated in NATO’s Exercise Ocean Adventure. During their 1982 Mediterranean deployment, the Pukin’ Dogs, with three Tactical Air Reconnaissance Pod Systems (TARPS) equipped aircraft, once again provided CAP for the evacuation of American citizens from war-torn Beirut. During their 1983 MED deployment, VF-143 flew 45 combat TARPS missions, providing the Multinational Peacekeeping Forces in Lebanon with intelligence of enemy troop movements and artillery positions in the mountains outside of Beirut. VF-143 and the IKE returned to the MED on Oct. 11, 1984, where they again found themselves involved in a tense Lebanon situation. After a lengthy break from sea operations, VF-143 returned to the IKE for a MED cruise from Feb. 29 to Aug. 29, 1988. Shortly following this cruise, in 1989 the Dogs made the transition to the F-14B Tomcat in 1989. 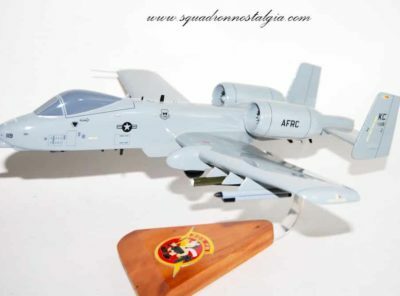 The Pukin’ Dogs found 1990 to be a highly successful year as they won the Strike Fighter Air Readiness Program (SFARP) trophy for the second consecutive year while achieving the highest score in SFARP history. VF-143 also won the Tactical Reconnaissance (TACRECCE) trophy for excellence in TARPS employment. 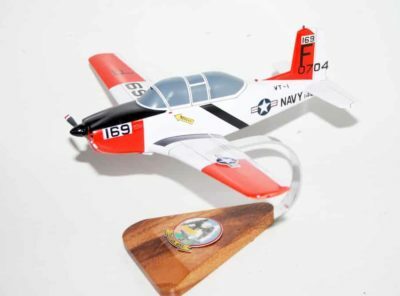 The squadron was also nominated for the Navy’s 1990 Arleigh Burke Award and the Department of Defense Phoenix Award for aviation maintenance. 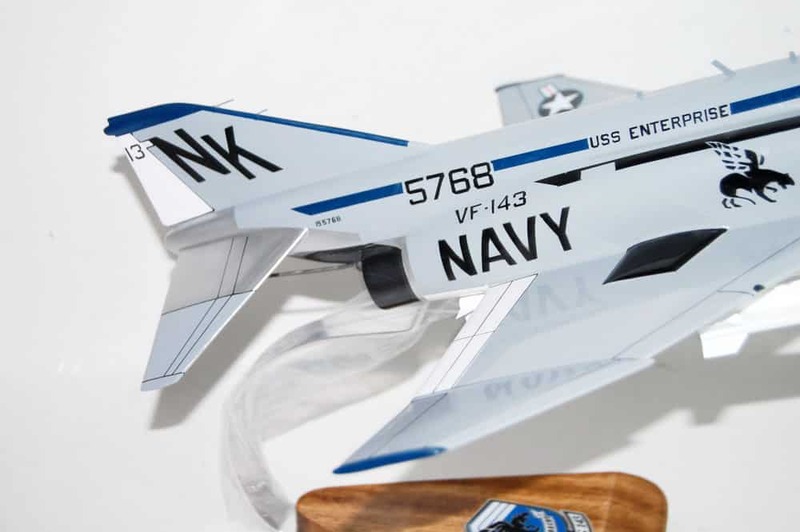 The successes of 1990 continued into early 1991 as VF-143 was awarded COMNAVAIRLANT’s Battle “E” as the Atlantic Fleet’s finest fighter squadron. 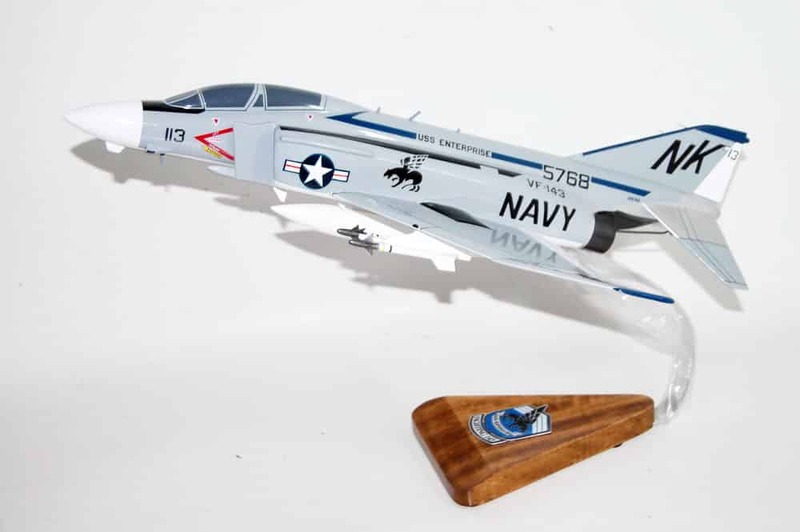 Further accolades came as the Pukin’ Dogs were awarded the Chief of Naval Operations Rear Admiral Joseph C. Clifton Award which designated VF-143 the Navy’s finest fighter squadron. In August 1992, the Pukin’ Dogs and the rest of Carrier Air Wing Seven were reassigned to the USS George Washington (CVN 73), the Navy’s newest aircraft carrier. VF-143 deployed on the GW on her maiden “shakedown” cruise, and then for her first Mediterranean deployment in May 1994 where she took part in the 50th anniversary commemoration of the D-Day invasion and Operation Deny Flight. This cruise was highlighted by the stellar performance of the squadron in both Bosnia-Herzegovina and the Arabian Gulf, particularly for the crucial TARPS imagery it provided. In January 1996, the World Famous Pukin’ Dogs completed their turnaround training cycle and departed on their second cruise in fifteen months. The preparation quickly paid off as the Dogs found themselves flying over Bosnia in support of Operation Decisive Endeavor and the Arabian Gulf in support of Operation Southern Watch. Carrier Air Wing Seven relied heavily on the Pukin’ Dogs to provide aircraft and trained crews for TARPS, Forward Air Control (Airborne), air superiority, and air-to-ground missions. The Pukin’ Dogs returned to Oceana in July 1996, having flown over 1,400 missions while enjoying an unprecedented 99.3 percent sortie completion rate. 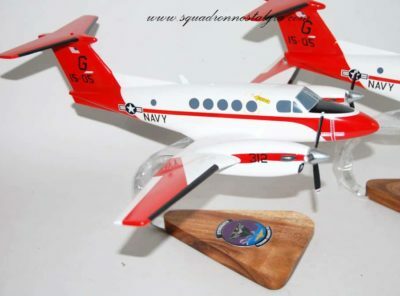 These extraordinary successes were a tribute to the professionalism and pride of all Pukin’ Dogs personnel, who were awarded COMNAVAIRLANT’s Battle “E” Award for 1996. February 1998 found the Pukin’ Dogs making another maiden cruise, this time aboard the USS John C. Stennis (CVN 74). Over 131 days were spent in the Arabian Gulf in support of Operation Southern Watch. 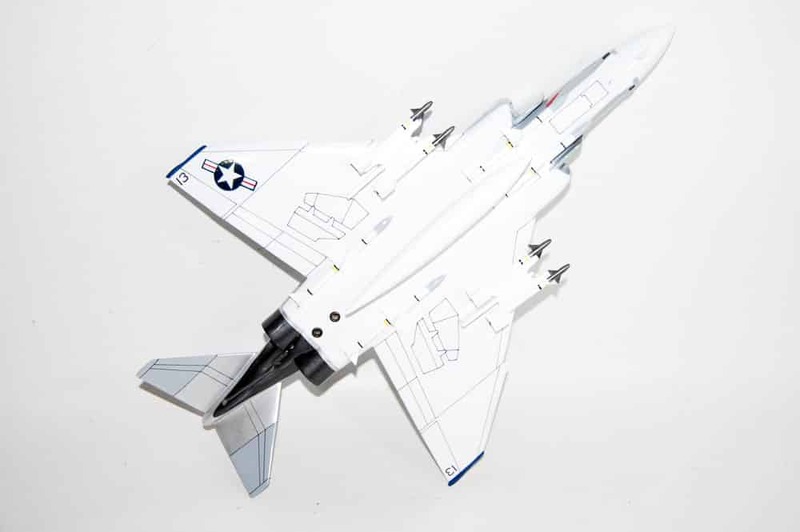 VF-143 played key roles using the Low Altitude Navigation Targeting Infrared for Night, night vision goggles, and digital TARPS. The excellence of VF-143 on this cruise was recognized by COMNAVAIRLANT again selecting the Pukin’ Dogs for the Battle “E” award. In addition to the Battle “E,” VF-143 was awarded the 1998 Safety “S” award. Twenty years after their first cruise aboard the USS Dwight D. Eisenhower (CVN 69), VF-143 once again boarded the IKE and headed for the waters of the Mediterranean Sea and Persian Gulf in 2000. 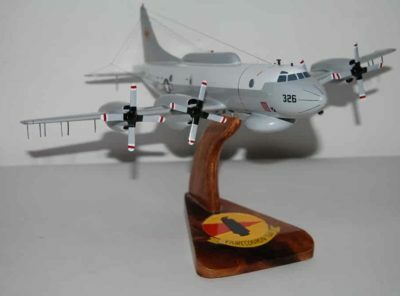 VF-143 protected the skies over Bosnia-Herzegovina under Operation Joint Forge and enforced the Iraqi no-fly zones by participating in Operation Southern Watch. In both theaters of operations, the Dogs maintained air superiority and displayed unparalleled success in the Tactical Reconnaissance mission. The highlight of this cruise was the successful delivery of laser-guided munitions in Operation Southern Watch. In February 2002, the Pukin’ Dogs cruised aboard the USS John F. Kennedy (CV 67) in support of Operation Enduring Freedom. This was a brand new type of conflict, and once again the Tomcat proved to be adaptable. With an upgraded LANTIRN and TARPS capability combined with the ability to fly five hour missions, VF-143 jets proved invaluable as RECON and Close Air Support (CAS) assets. 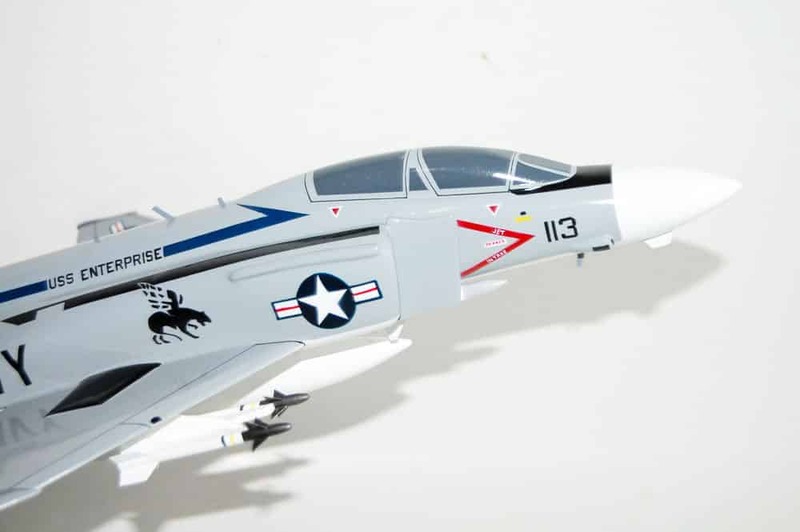 While flying over 1,300 sorties, VF-143 achieved a sortie completion rate of 98.2 percent, while successfully completing 99.9 percent of OEF sorties. Returning home in late August 2002 VF-143 took a well deserved break and earned the MUTHA trophy, an award given for their outstanding professionalism and fighter spirit both on and off the flight line. The squadron’s last Tomcat deployment occurred in 2004 aboard George Washington in support of Iraqi Freedom, during which time the squadron participated in strikes over Fallujah between April 28-April 29. Following this historic cruise, the squadron spent six months in Lemoore, Calif. transitioning to the single-seat F/A-18E Super Hornet and upon completion was subsequently re-designated VFA-143. 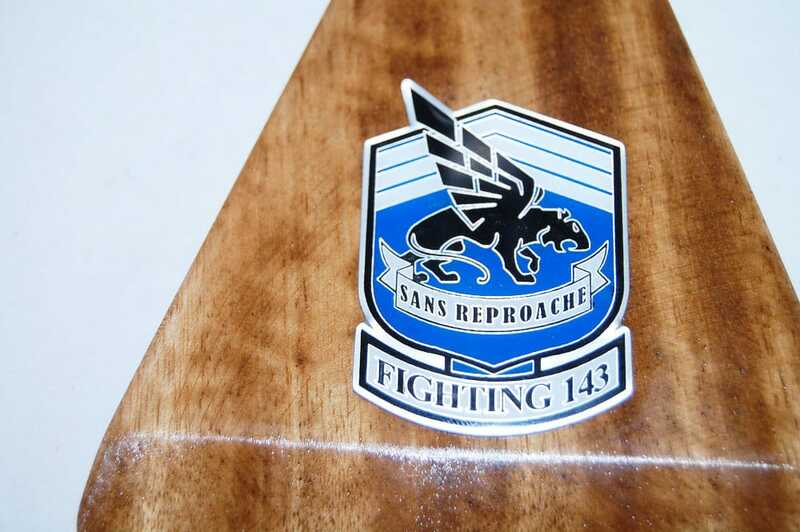 In October 2006, VFA-143 made its first successful deployment as a Rhino squadron onboard the USS Eisenhower in support of Operation Enduring Freedom, Operation Iraqi Freedom, and the Global War on Terrorism. In February of 2009 the Dogs headed back to sea in support of Operation Enduring Freedom. During this six month cruise the Pukin’ Dogs did their part by dropping over 30 bombs on enemy positions throughout Afghanistan. Returning home in the summer of 2009, the Dogs quickly entered a turnaround cycle in preparation for their upcoming 2010 deployment. As advertised, VFA-143, aboard the USS Dwight D. Eisenhower (CVN 69), successfully embarked on January 1, 2010 for their deployment in support of Operation Enduring Freedom. During both deployments the Dogs supported Operation Enduring Freedom providing kinetic and over-watch support to coalition troops on the ground in Afghanistan. The Dogs led the air wing in 2010 earning Top Hook three out of four line periods as well as all of deployment. For their exceptional achievements during these deployments they earned the 2010 COMNAVAIRLANT Battle Efficiency, Wade McClusky, and 2011 Secretary of Defense Maintenance (Phoenix) Awards. In June 2012, the Pukin’ Dogs deployed onboard the Mighty IKE for 6 months in Support of Operation ENDURING FREEDOM providing FREEDOM providing kinetic and over-watch support to coalition troops on the ground in Afghanistan. The Dogs also conducted National Security Objective Missions.